Shipping in June from Robot Kingdom that is. I'd buy like a thousand if it were the original prototype hot pink one that was in the posters and the 1986 Toy Fair catalog. It should be nice to have one now that they have the trademark back. Aw man! I had to get "Rodimus Major" signed by Judd Nelson at BotCon 2016... Why didn't this come out a couple years ago? It's something I wouldn't go out of my way to get, but I'd probably nab one if I saw it on the shelf. Think of it this way. You got the naturally* grown up version of Hot Rod signed by the grown up version of Judd Nelson. * -- As in non-Matrix-induced, like Rodimus Prime was. It's nice to see what looks like the classic box. I'll be interested to see what other reissues they do like this. A carded Bumblebee, probably in some big ridiculous outside box? I'll believe this when I see it on the shelves for the one day it's there. More popular nowadays? 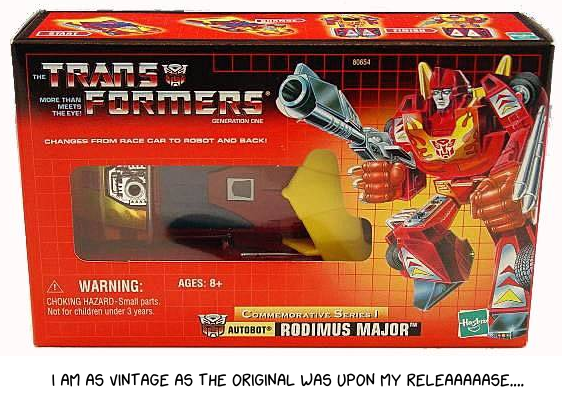 I remember the Rodimus Major sticking around for quite some time. It is also surprising they will be using that box. Even the previous reissue box is about the same size as that (and the original) and the box feel very small. Relative shock of seeing how Japan packages things vs US perhaps, or perhaps US packaging has just gotten bigger. The listing explicitly says "here are some random G1 Hot Rod pictures". This may or may not be in a repro box, but there is no evidence either way here. Just googling the box images, the "AGES 8+" bit is not what appeared there on what appears to be the standard G1 box. So yeah, it's explicitly not necessarily a picture of the real reissue, but the box does appear to be "new" and might be a clue. And its up on the front page. I liked that post but I emphatically no longer like you. They used the old logo on last year's SDCC Cobra Missile Command Headquarters box. Edited by Dake, 05 May 2018 - 12:05 AM. Argh, I foolishly did what everyone else on the entire planet did and stopped paying attention to GI Joe, and look where it got me. Well, in that case, I guess I won't be impressed if they use it on Hot Rod.